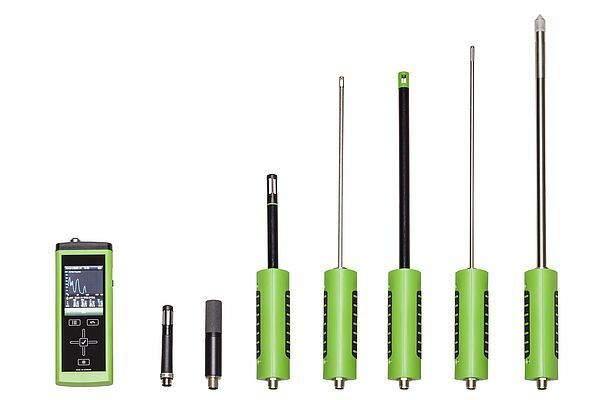 E+E Elektronik's Omniport 30 hand-held transmitter is now available with a CO2 probe with a measurement range of 0...2000 / 5000 / 10,000ppm. This means that the device can be used for ambient air monitoring or for CO2 leak localization. Other E+E probes for humidity, temperature and air velocity and the integrated air pressure sensor make the product a universal transmitter for a variety of applications. A total of up to 23 different measurements can be recorded and stored. The device offers continuous and single-point data logging with time stamp. Up to three measurements can be displayed simultaneously on the large, easy to read TFT display. The data can also be displayed in the form of graphs. The intuitive menu guidance and touchscreen navigation make operating the hand-held transmitter easy and user friendly. The internal memory of the Omniport 30 provides space for up to 2 million measurement values that can be transferred to a PC via USB interface. Complimentary data management software is available to carry out further analysis and archiving. Software updates can also be carried out via the USB interface.